Video clip synopsis – The axemen established camps throughout the eucalypt forests in the early 20th century. Their job was a combination of skill and stamina, harvesting giant trees for the rapidly growing hardwood industry. Broadband MP4 timber_bb.mp4 (9.6MB), suitable for iPods and computer downloads. 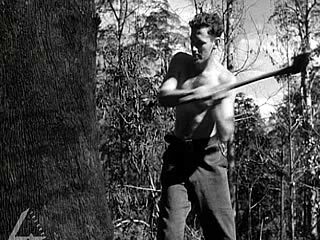 Axemen Fell Giant Trees is an excerpt from the film The Timber Getters (11 mins), produced in 1949. The Timber Getters: In post-war Australia, the milling of our nation’s prized hardwood timbers was a rapidly growing industry. Mechanisation introduced economies in the handling, but the skill and stamina of the axe-men were still indispensable in timber getting. This short film looks at the work of the men living in bush sawmill camps. The Timber Getters is a National Film Board Production. Produced by the Department of the Interior. H.9 A student assesses the appropriateness of a range of processes and technologies in the investigation and organisation of information and ideas. During the late 1940s, Australia was at the start of an economic boom, a large part of which included a demand for new houses for the soldier generation who had delayed family life for the six years of war from 1939 to 1945. Timber was a key material needed for housing construction. The video clip also shows an industry on the cusp of great technological change. The centuries old manual methods used to fell trees were about to be replaced by increased mechanisation — for example, the crosscut saw was about to be replaced by power saws. We see a hint of this in the use of the small tractor to drag away the fallen log. One of the great implications of this change in technology would be the vastly decreased time, effort and manpower needed to fell trees, and a consequent increase in clearance rates and extent. An industrial revolution was about to occur in the industry. At the same time modern concepts of 'environment’ had not developed. The attitude of most people was that forests were a natural resource for human use, not a source of habitat for ecological sustainability. The filmmaker presents the occupation of ‘tree felling’ in 1949 as a noble and manly occupation. Discuss and list ten examples from the video clip that agree with the above statement. Describe how the filmmaker uses cinematic techniques (camera shots, music, editing, voice-over etc) for each example you listed. There was a cheaper and more efficient way of felling trees developed? There was an increase in the demand for timber? There was an increase in wood substitutes? There was a change in attitude to the environment? Compose a two-minute voice-over for the same video clip from the point of view of a person opposed to logging of old growth forest today or from a supporter of the timber industry today. You will need 800 words. Research and include as many facts as you can. Present the new voice-over using the video clip, with the sound turned off, to your class.